← COACH it or ALLOW it! 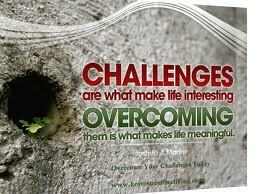 Challenges are opportunities in disguise! You know you need to make some changes. You know your practice is not where you want it to be, where you vision it to be, where you know it CAN be. What on earth are you waiting for? We know that change doesn’t come easy, and usually comes with a small price. But what you get when you don’t change is more difficult and costly than implementing the change itself! I love this quote! To overcome your challenges your thinking process needs to be altered! It’s not a problem, it’s a challenge. Problems cause stress and discontent, challenges are opportunities in disguise! With that being said, what 3 challenges would you like to overcome within your practice by year end? It’s not enough to say “I want to increase my production”. You need to know what specific challenges need to be addressed and overcome. Find out where you are, where you want to be, and how you’re going to get there. New patient intake & followup – Do you know what the best LAST question to ask a new patient caller? Just to mention a few? Which areas of challenge do you see within your own practice? We have spoken with many dentists who don’t know how many patients are on their past due recare list…. Don’t know how much undone treatment is sitting on their walls…Don’t know what their insurance aging or accounts aging reports look like… Don’t know how a new patient is welcomed… Don’t know how financials are being presented…..You get the picture. Do YOU know? Remember, every single process, team member, protocol and system is a direct reflection of you. Are they all speaking in correlation with your visions and what your practice stands for? There are over 160,000 dental practices in the US. What sets your practice apart from the rest? We can’t stress enough the overwhelming need for exceptional patient care. From the very first phone call to exiting your practice from their first visit, continual efforts need to be made to show the patient they made the right decision in choosing your practice as their dental family. We encourage you to listen how your phone is being answered, watch how a new patient is greeted upon arrival at your practice (are they being welcomed with a handshake and a big “thank you for choosing Dr. So&So’s practice and WELCOME!”?) and become secure in knowing that your team provides unmatched, superior patient care! Here’s the great thing about superior patient care… It’s the most economical internal marketing tool you have. It takes passion, dedication and daily motivation. Superior patient care = happy, loyal, trusting patients = patients accepting & scheduling treatment = patient referrals = increased production = happy dentist & team. Don’t settle for less than what you expect for yourself or your family. Don’t settle for systems that are sometimes followed. Don’t settle for mediocre. Because if YOU are settling for that, you are asking your patients to settle for that. Is that good enough to show an increase in production? The moment you settle for less than you deserve, is the moment you get less than what you settled for. Rise to the challenge of addressing ONE issue next week that you would like to see overcome within your practice. How good is it going to feel to know that you are getting the ball rolling so to speak? How good might it feel to see a slight improvement in production next week, or get a few new patient referrals? Little changes lead to big differences. So, what are you waiting for?! Here’s to a marvelous week of defining your challenge and implementing the process needed to not only overcome, but CONQUER it! Opportunity doesn’t quit calling because you’re out of the office……let it call US!! Administrative, Clinical and Hygiene Comprehensive Dental Systems – custom designed for YOUR success. Check out what Dr. Myers has to say about Dental Support Specialties! 2 Responses to Challenges are opportunities in disguise! As usual, excellent article, Mary Beth!